We are a small family run business and have been trading for 25 years from our offices in the historic market town of Needham Market set in the heart of the East Anglian countryside. When we began, way back in 1987, we specialized in supplying other Seed Houses both in the UK and elsewhere around the world with rare and unusual flower seeds. For instance, at one time we were the largest supplier of Meconopsis betonicifolia, the rare Blue Poppy and we had and still have many specialist collectors working with us. As the years have gone by our business has changed and we have done our best to adapt with the times. In the early days we were approached by several overseas companies to supply seeds in foil sachets for them to sell to shops and garden centres in their respective countries. Over time we found ourselves supplying Australia, USA, Canada, Japan, Scandinavia and several other European countries too. All seeds are despatched in excellent condition. Should you be dissatisfied with the condition of any seeds/plants purchased, please let us know within 14 days of sowing. Obviously we cannot take responsibility for horticultural problems outside our control, e.g. drought, frost damage or insect damage. Liability is limited to the purchase price of each seed packet. All seeds are offered in good faith as being true to name and description and are intended for private gardeners only. 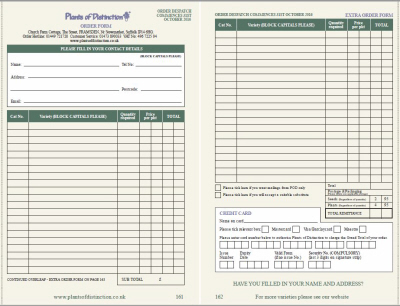 UK Seed Orders - All seed orders will be dealt with separately from plants. Please allow 7-10 days for your order to be processed. Peak season please allow up to 10 days. Overseas Seed Orders - Seeds can be sent worldwide however due to changes made by the British Post Office postage will be £4.95 per order. Plant Orders - Plants are available to UK and EC customers only. A £3.50 surcharge will be levied to all EC plant orders. Plants are despatched seasonally at an appropriate planting time, typically during the Spring months. Postage & Packing Charges - £2.95 UK Seeds only, £4.95 UK Plants & Bulbs, £7.90 UK Combined Seed & Plant orders, £4.95 Overseas Seeds only, £8.45 EC Plant Orders only, £13.40 EC Combined Seed & Plant orders. Our attractive printed Gift Vouchers are sold in multiples of £5. Vouchers are an ideal gift for keen gardeners, you can buy vouchers online, by telephone or by post. Unfortunatley we are unable to redeem printed gift vouchers against online purchase at this time, although this is something we are working to rectify. To redeem a printed gift voucher please post the voucher to us along with your completed order form. All prices include VAT at the current rate where applicable. For online transactions we accept payment by Visa, Mastercard or Maestro credit and debit cards. We also accept payment by Paypal. The above credit or debit cards are also accept for telephone orders. Orders placed by post can be paid for by card and also by cheque or postal order. Payment for online and telephone orders will normally be processed at the point of order. We work with a secure, reputable third party payment gateway Secure Hosting, to process card payments. Secure Hosting uses digital signatures and strong encryption ensuring that your information is protected throughout the transaction. We collect your email and postal address along with your buying information so that we are able to process your order. If you give us your email address we will add this to our marketing database and may send you notifications of sales and special moffers in future. If you have indicated that you would prefer not to receive email marketing we will not use your email address in this way and will only use it to communicate regarding your order. We DO NOT share customer details with third parties and WILL NOT make your details available to other companies. If you click on a link in an email you receive from us a cookie may be set on your web browser. When you visit our website after clicking on that link we are able to understand how you and your web browser interact with our website. This allows us to better understand what you as a valued customer are interested and also what elements of our website may not appeal to you. This helps us to improve the way we communicate with you, to improve our website and in doing so to improve your experience whilst you are visiting us. This information is strictly for our use only - we never disclose or share this information with any third parties. If you prefer that we do not collect this information you can prevent cookies being installed by changing the cookie settings in your browser. During online transactions, sensitive information such as your payment card details, are neither collected nor stored by us, at the point of payment your order is handled directly through third party secure payment gateway providers, Secure Hosting, or Paypal. All systems used by Secure Hosting for the processing & storage of card information are audited and validated by Qualified Security Assessors to the highest possible standard available under the PCI:DSS scheme. If you would prefer to order by post, or have printed Gift Vouchers to redeem, please download our PDF order form.